When you have a development server - a virtual machine or even a spare laptop - you eventually run into problem of email delivery because your application needs to send emails for whatever reason. Due to well known email spam problems the internet service provides typically no longer allow users to send email using unauthenticated SMTP connections. I have a virtual machine running on my Fedora laptop where I write some test applications, and I travel from network to network every day so I cannot configure any outbound SMTP connections without exposing my SMTP credentials - which are btw. usually same as the IMAP credentials - to a configuration file of e.g. Postfix. Local-only delivery to the rescue! Restart your Postfixes and you should be ready to go! Test RHEL7 without installing it - on Docker! So there's this new interesting operating system you'd like to try out? Traditionally you had to find a spare laptop where to install it on, and later on you installed them on virtual machines running on your laptop. Nowadays things are even more easy; Docker provides an easy way to create software containers without you having to provision virtual machines or having to hunt for spare laptops. Currently I'm running Fedora 20 on my laptop and in order to demonstrate stuff on RHEL7 all I need to do is to launch a RHEL7 in a container using Docker. https://access.redhat.com/search/browse/docker-images#? -> "Red Hat Enterprise Linux 7 base image container in Docker Format"
So what just happened? We told Docker to run "rhel7" image and start "/bin/bash". Option -t allocates a pseudo-tty (terminal) and -i is interactive mode. If you forget the flags your image is started in background. You'll probably want to learn about creating your own layered images, creating services within the image such as Apache or MySQL etc. One good place to start learning is the Red Hat customer portal: https://access.redhat.com/articles/881893 "Get Started with Docker Containers in RHEL 7". They didn't have definition of OpenShift, but since you are reading this you probably know what it is. 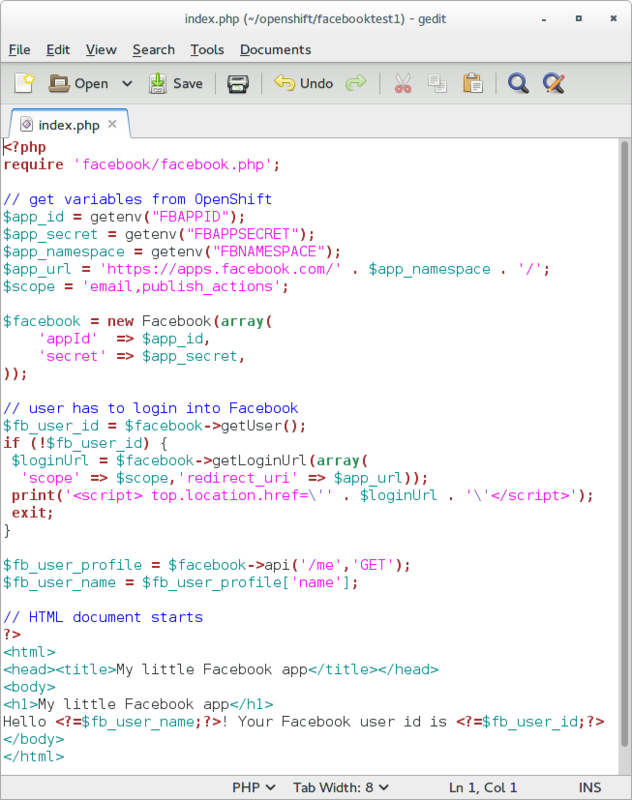 So you want to develop an application for Facebook and you wonder where to host it? That's one thing OpenShift can help you with. The steps to create a simple Facebook application on OpenShift are very easy. I created a small "hello world" application with PHP to show how it's done. Go to OpenShift Online and create new PHP 5.3 application. I've used "facebooktest1" as the name here. 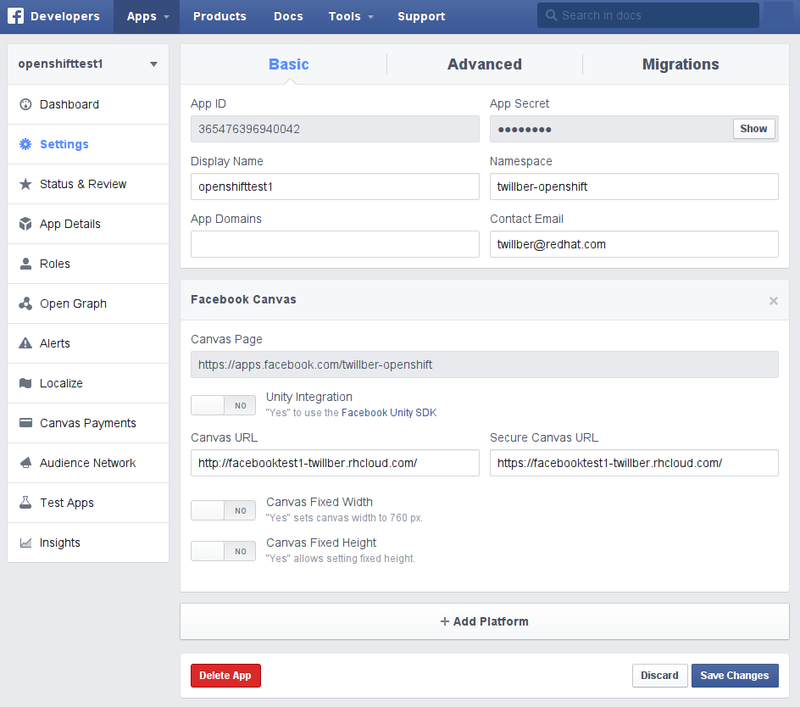 At https://developers.facebook.com create your Facebook application and add platform Facebook Canvas into it. Use the application URL from OpenShift as Canvas URL. In this example I've used openshifttest1 as the application name. You'll need to set some environment variables in order to avoid having to insert Facebook App ID and App Secret into your source code. Namespace is your OpenShift domain name and application name is the OpenShift application name.